You and your guests will be cruising the Maryland Sector of the Chesapeake Bay, casting flies or lures, to catch striped bass and other saltwater species. You'll learn a variety of productive locations and techniques needed to catch these hard fighting fish from topwater to the bottom. Throughout the entire day we'll be on the move. Once active fish are located we'll drift over them until they stop biting, then back on the move again! You and your guests will be aboard a 22 foot long, 8 feet 6 inch wide power catamaran especially designed to fly fish or light tackle fish the Chesapeake Bay. This boat will supply a smooth dry ride throughout your trip. Everything is provided. 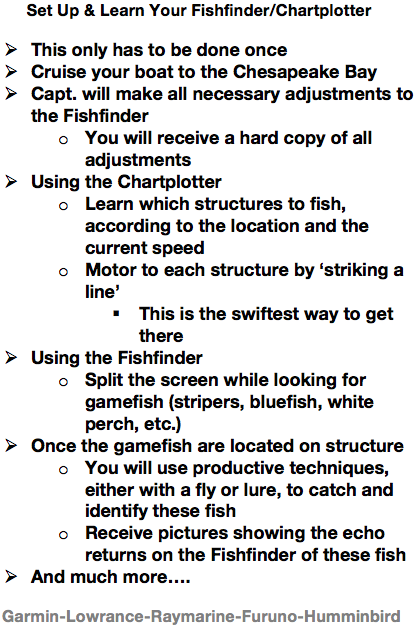 Stop second guessing the most important piece of equipment on your boat your fishfinder/chartplotter. Learn to interpret the return signals that shown on your screen(s) to identify the type of fish you're on; baitfish or gamefish. Also learn when and where to operate the many features used on your chartplotter. I will bring all fishing equipment to guide you on this trip. Breakdown of this trip. A gift to cruise the Chesapeake Bay and to fly fish or light tackle fish for striped bass and other saltwater species will always be remembered.